** NOTE ** Please read the terms and conditions below the band lists, we cannot be responsible if you dont read them, this is for your benefit as well as ours. We are not the actual band, nor do we try to say that we are. We are mearly re-creating some of the best bands in a digital form to help people who can’t see the bands live have an experience similar to that of a live concert. Band prices start from as little as 1600$L for approx 1hr 30 min show, our visual effects are 2nd to none – full stage show as close to the real thing as you can get. A non refundable deposit of 600$L is required at the time of booking, on receipt of this you will have entered a contract with Bad Ampitude as per our Terms & Conditions, (Full payment due at the start of the concert). We ask to allow our host to rez a tip jar, we don’t require tips but appreciation is always nice to have. Please IM Vampira Voom if you are interested in one of the bands. Please note: Back to back booking of two or more bands on the same day WILL incur extra charges, as will private parties and concerts on homesteads. *NOTE* Cancellation of a concert within 48 hours will be charged at full price. When booking a band, there are a few things needed by us as band members. * At least two group members (builder/host) to be added to the building group on your land to put in equipment and tip jars. If a build tag is not provided in time (24 hours prior) the concert will be cancelled and you will be charged in full. This is the responsibility of the person who booked the concert to ensure build tags are provided in time. * Stages will be put up between 3am to 10am the day of the concert (or before if you prefer), please make sure that the area is cleared by those times. * Promotion/Search entry – Promotion of the event is YOUR responsibility (We will of course advertise within our own groups). T-Shirts (with your logo cost 200-400$L depending on the logo) & promo posters can be provided at an additional cost of 100$L. 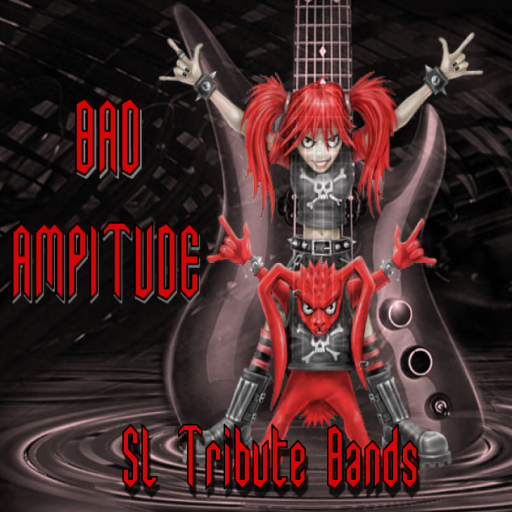 No more than 2 invites will be sent to join the Bad Amp Fan Group during any single show. * We can and will provide a stage for your club for the day of the event, we only use our own stage for the full ‘real’ concert effect. Please realize that some the equipment is often heavy in prims and we will need at least 450 – 800 prims open for all stage equipment. (depending on the stage, ask at time of booking). If you would like a show but don’t have the prims, occasionally we can accommodate. * If you have your land set to “NO SCRIPTS” please be sure to turn them on the day of the event or else none of our instruments or items will work. (if your scripts are set to group only please make sure tags are sent in time). * TP/Landing points should be near to the concert area, so people don’t have to search for it. * Voice should NOT be enabled during a concert. * Excessive club lighting/particles must be turned off and retracted. * No advertisements, Tip Jars or decorations to be placed directly infront of the stage, ask one of our staff if you are unsure where to place them. * Land that is *Homestead* must be mentioned at the time of booking to avoid cancellation, ie 20 person limit. * Large bowl of Blue M&M’s must be provided. * Once the deposit has been received you will have entered a contract agreeing that you have read and understood the terms & conditions. We can provide our own media stream if necessary. Please make sure that there is someone available at the time of the concert to change the music settings, we cannot be held responsible if nobody can change it. ** NOTE ** If the stream cannot be changed you will be charged in full and the concert will be cancelled.